I saw this picture online today and it made me think of Nana - my maternal great-grandmother. 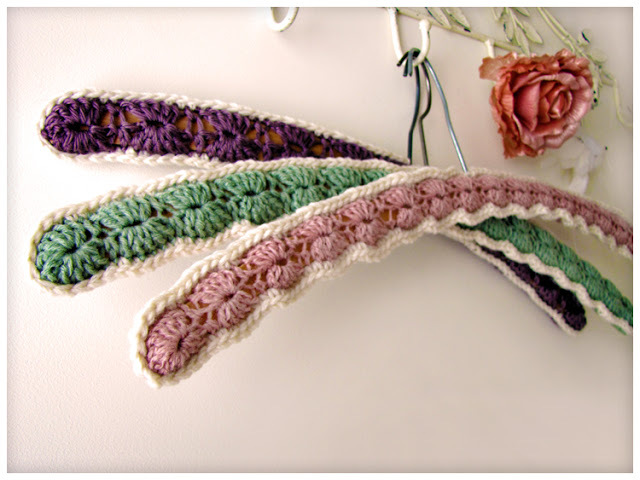 She used to make these with crochet cotton. I actually remember seeing her working on some. She was a real crocheter - doilies on tables and arms of chairs, and backs of chairs, and about anywhere with a flat surface. I miss them. I never really liked them, but when I had them I was too young to understand the value of good hangers. Now I know. Wire hangers are horrible (insert your favorite "Mommy Dearest" reference here) and the fuzzy covered ones are weak and break easily and even plastic aren't that great. I have some plastic hangers with little rubber grippies on the shoulders, but even then, they aren't like Nana's hangers. This Thanksgiving I find myself thinking of family members that have passed away. I seem to come from a long line of crafty and artistic people. I hope wherever Nana is she is proud of my knitting, and understands why I don't crochet. 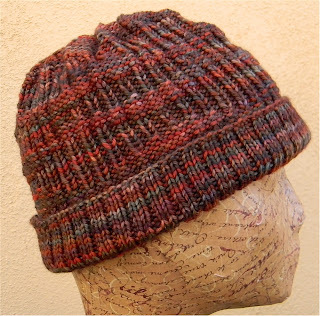 Textural, with subtle scientific slant, the sine wave men’s hat offers even the most stubborn to knit for an attractive, yet intellectually stimulating, source of warmth. 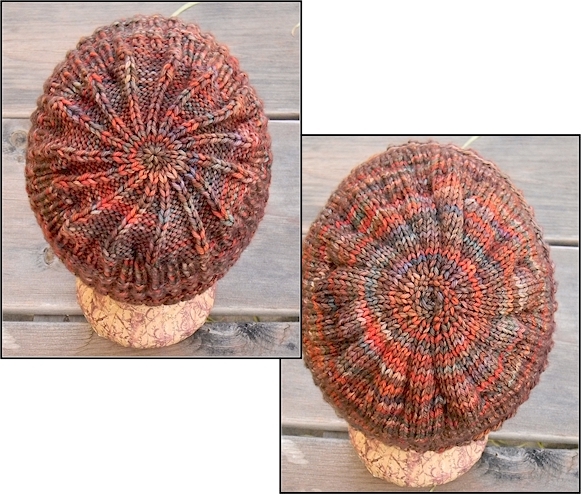 This reversible hat even offers styling options. Right-side offers high-texture look, the reverse a low-texture alternative. Fold it, roll it, wear it slouched, this hat is for every man. High elasticity ensures comfort; no more avoiding hats that squeeze and give headaches. Yarn Requirements: Approximately 155 yards of worsted weight yarn. Shown in Malabrigo Rios (color: 121-Marte) Superwash Wool, 210 yds/100grams . Supplies: 5 Stitch markers, tapestry needle. Row counter is helpful. Needles: Size 5 (3.75mm) 16” circular needles and a set of double pointed needles (DPNs) in the same size. Gauge: 24 sts and 32 rows = 4” (10 cm) in stockinette stitch in the round. Change needle size as needed to obtain gauge. Have you tried Craftsy yet...? Actually, I'm enrolled in nine different Craftsy classes. I'll be doing an in-depth review of my latest enrollment very soon - so keep your eyes peeled! I'm sending two skeins of di.Ve Autunno 100% Fine Merino (50g/98yds each) in Naturals-33410 - Valued at $15.00 to "ahappyaccident" who shared Judy's Magic Cast-On from Cat Bordhi's video tutorial. Congratulations to ahappyaccident and be sure to check out this great video! She’s smart, stylish and a fierce advocate for those without a voice. Bold, brave and definitely someone you want on your side, Ms. Billey is a friend to the end. 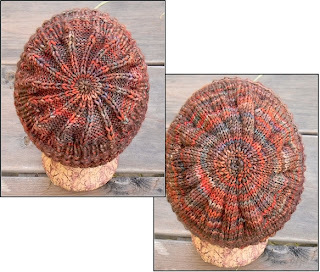 This beret makes its statement with Fair Isle and cables. For extra punch, sew on beads and give your owls true vision. Sizes: Women’s - Will stretch to fit head sizes up to 22”. Yarn Requirements: Approximately 160 yards of Color A (Dark) and 90 yards of Color B (Light) worsted. Needles: Size 4 (3.5mm) 20” circular needles and a set of double pointed needles (dpn(s)) in the same size. Supplies: Stitch marker, cable needle, tapestry needle. Row counter is helpful. Change needle size as needed to obtain gauge. 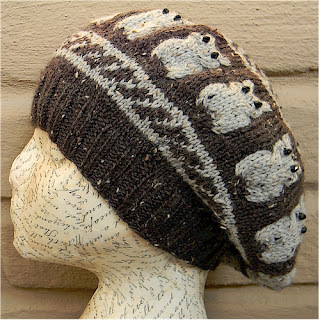 Available via Ravelry just in time for Christmas knitting - $3.00.